Whitewater kayak self-support kayak trip on the emerald green waters of the Eel River. I first ran the Eel River in 2009. 10 years later, I am still entranced by its magic and feel privileged to have it as my backyard run. Of course, I wish the flow was more consistent and predictable. But the uncertainty is what keeps the crowds away and keeps things interesting. 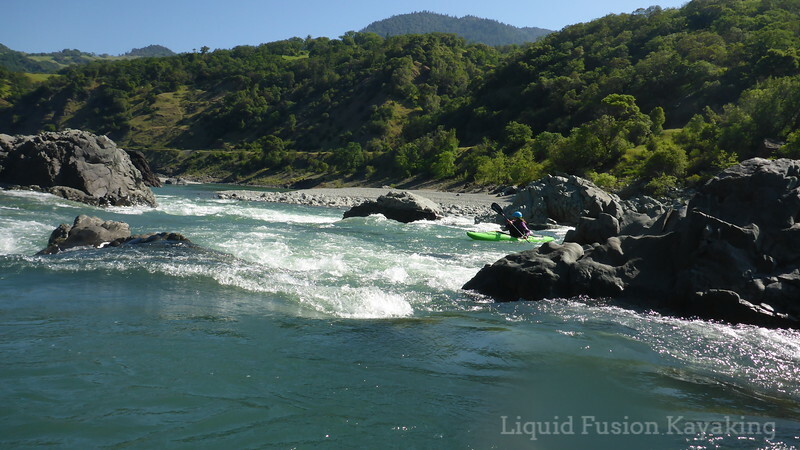 The Eel River has different options for day trips and multi-day trips and both flat and whitewater. My favorite are the wilderness stretches of the Eel and when we have the luxury of a self-support kayak camping trip. Kayak Camping on the Eel River. 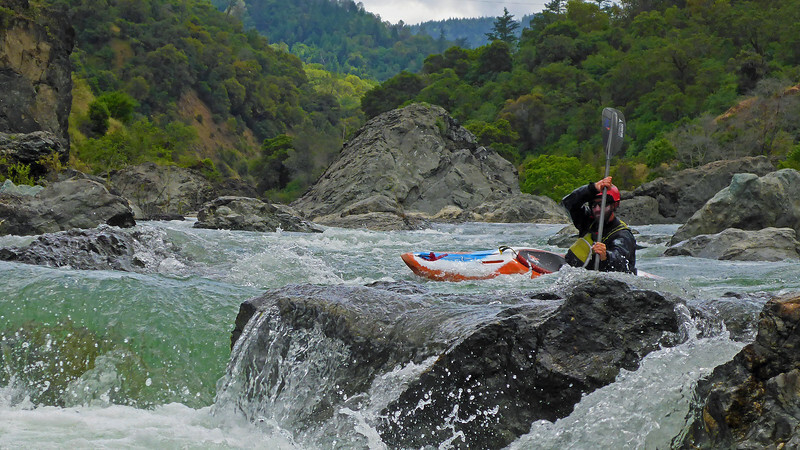 Dos Rios to Alderpoint is a sweet 46 mile Class III whitewater stretch. 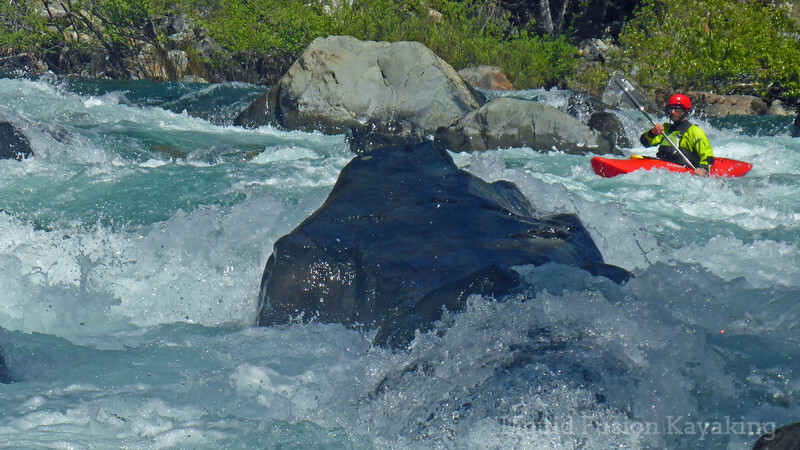 We have enjoyed several high water, whitewater kayak trips from Dos Rios to Alderpoint. Usually this is just after a significant rainfall and the water is fast and loaded with sediment (The Eel River Watershed has the highest erosion rate in the United States). Whitewater kayaking down the silt laden Eel River at high water. 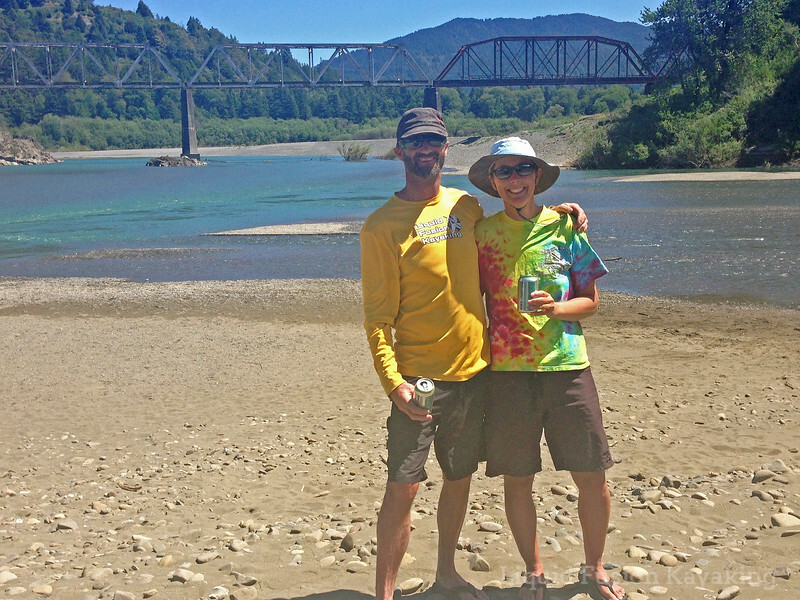 Last spring the stars aligned for Jeff and I to paddle the Eel River at lower water and experience its emerald green waters. Our journey took us down 70 miles of the Eel River from Dos Rios to Dyerville. This stretch of the Eel River runs through Mendocino, Trinity, and Humboldt Counties. The tri-county region is often referred to as the Emerald Triangle for a variety of reasons. 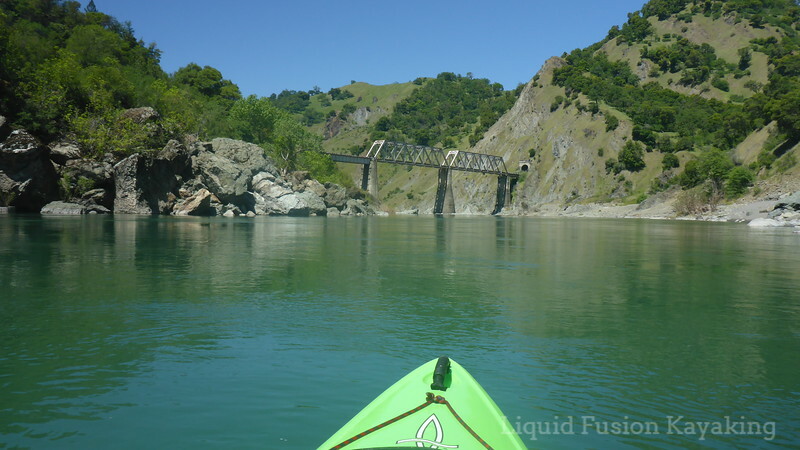 Naming our trip - Paddling the Emerald Triangle was inspired by the beautiful emerald green color of the water as we paddled through the tri-county area. Late spring run on the emerald green waters of the Eel River. 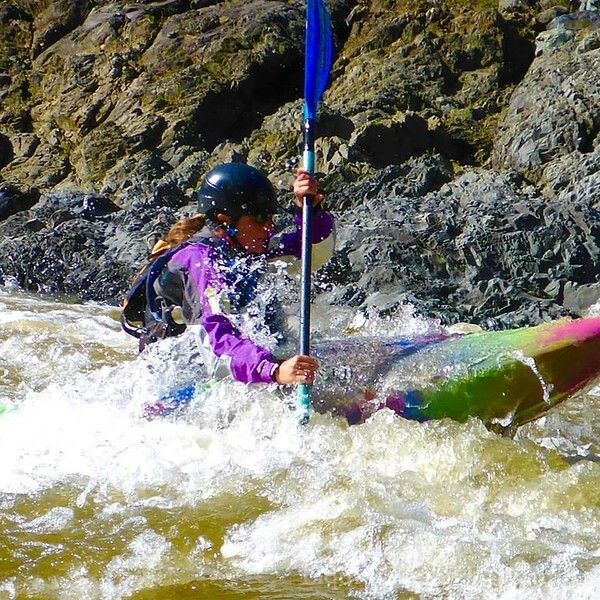 The 46 miles from Dos Rios to Alderpoint is the Eel's traditional multi-day whitewater run. At high flow, things are fast and furious. At low flow things are a bit more relaxed. At high water (10,000 cfs and higher) the river moves fast. The rapids have big waves and powerful hydraulics that most would say puts it above its usual Class III rating. Paddling pal Jerry Albright with a clean high water line through Kekawaka Falls. 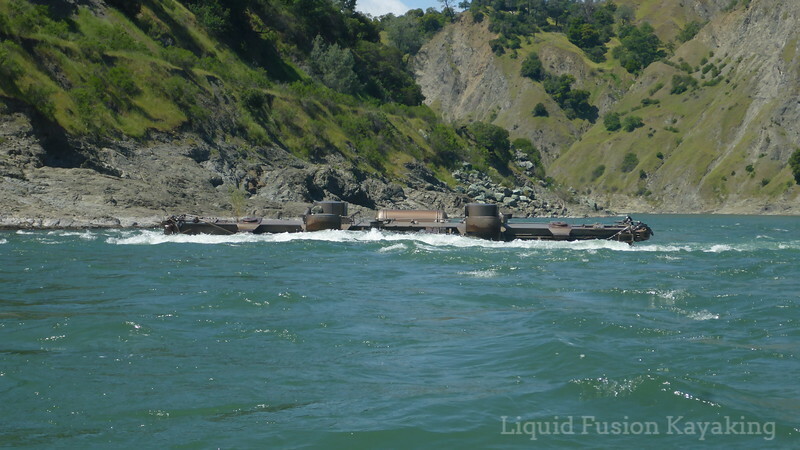 At lower water 2,000-4,500 cfs, there are a few Class III pool drop rapids interspersed with Class II and flat stretches. 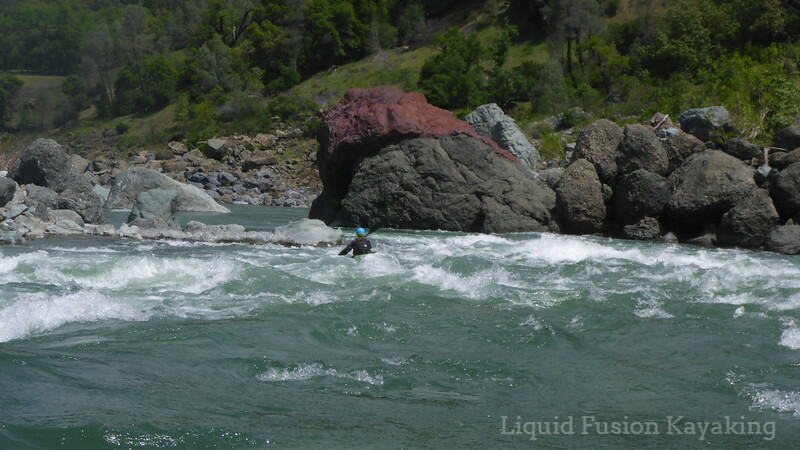 Playing my way down a pool drop class II rapid on the Eel River below Dos Rios. The remarkable thing about running the Eel at a lower flow is getting to see many of the fascinating rock formations that are under water on higher water runs. The rocks of the Eel River are quite varied and interesting. At lower water, you get to see more of them. This red capped rocks is one of my favorite rocks on the Eel River. 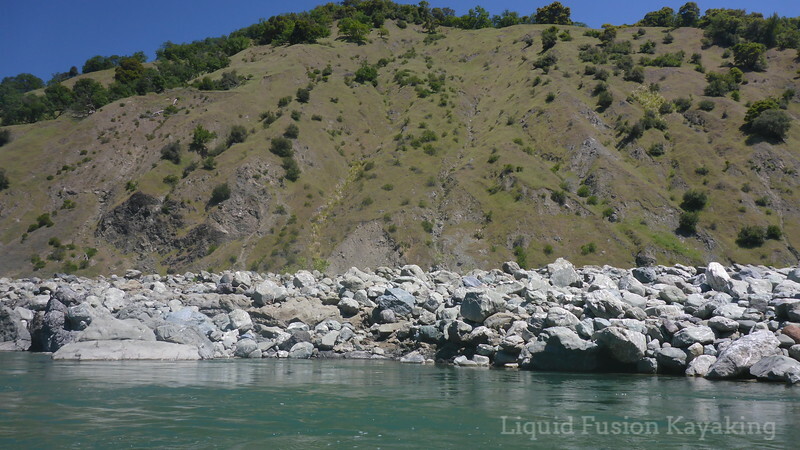 At high flows creates a scary recirculating eddy into a cave. One surprise was the huge boulder field on the river right bank of Island Mountain below Island Mountain Falls. Boulder bank on river right at Island Mountain that you only see at low water. 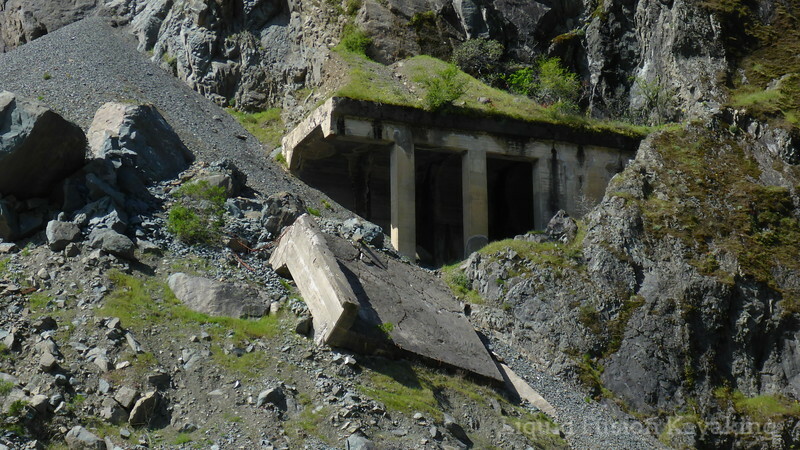 I also find fascinating all the remnants of the now defunct Eel River Railroad. At low water, we got to see the infamous car in the river that creates a rapid. Rail car in the middle of the Eel River. Since our last trip, the Great Redwood Trail Act was passed. The state is still working out the logistics but the plan is to create a rails to trails that would go from Marin to Eureka. Much of this would go through the Eel River Canyon. Eel River Railroad bridge to Island Mountain. This is an exciting and awesome project but literally has many obstacles to overcome before hikers and bikers can enjoy a trail through the Eel River Canyon. Dreams do come true and we are crossing our fingers for this one. Landslides have made much of the rail line along the Eel River impassable. The 30 miles from Alderpoint to Dyerville is essentially Class I. This is where a bit faster current might be nice. There are some spectacular waterfalls along this stretch as well as a flat water gorge that is the definition of tranquility. Waterfalls enhance the scenery of the Eel River Canyon. One of my favorite parts of this section is going for a hike in the Avenue of the Giants. 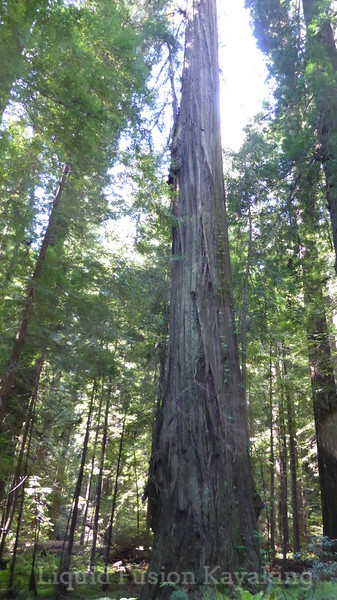 These are some of the largest redwood trees in the world. Hiking through Avenue of the Giants during our Eel River Trip. After a hike, we are just around the corner from our take-out on the gravel bar at Dyerville. This is the confluence of the South and Main Forks of the Eel and in the heart of Avenue of the Giants. Last year we were a bit overwhelmed with hordes of cars and people on the gravel bank. They were there for the Avenue of the Giants Marathon. It was quite a shock to go from just the 2 of us for 7 days on the river to seeing hundreds of people. Cars for Avenue of the Giants Marathon parked at the Dyerville Confluence. Fortunately the marathoners and fans cleared out by early afternoon as our friends were stopping by to pick us up. It is always nice to celebrate the conclusion of a great trip with a cold beer. Our friends styled us with Eel River Brewing Company's Emerald Triangle Pale Ale. Enjoying fermented Eel River water at the take-out - Eel River Brewing Company 's Emerald Triangle Pale Ale. 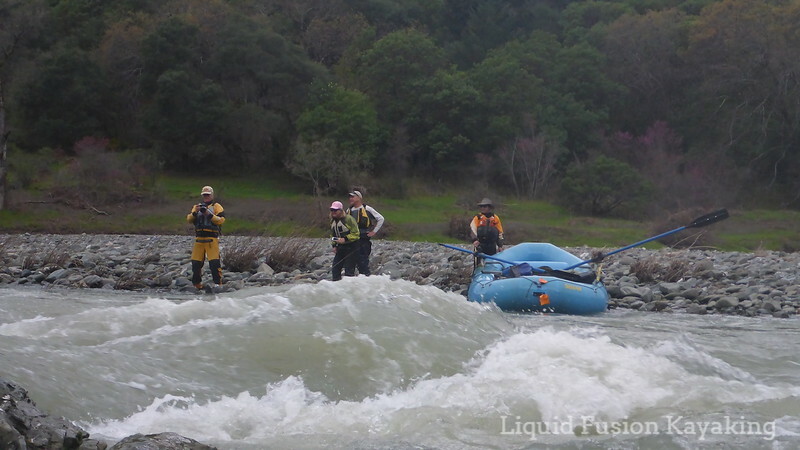 Last weekend we had the privilege of sharing a wilderness whitewater run on the Eel River with several of our mountain biking friends. It was their first river run. 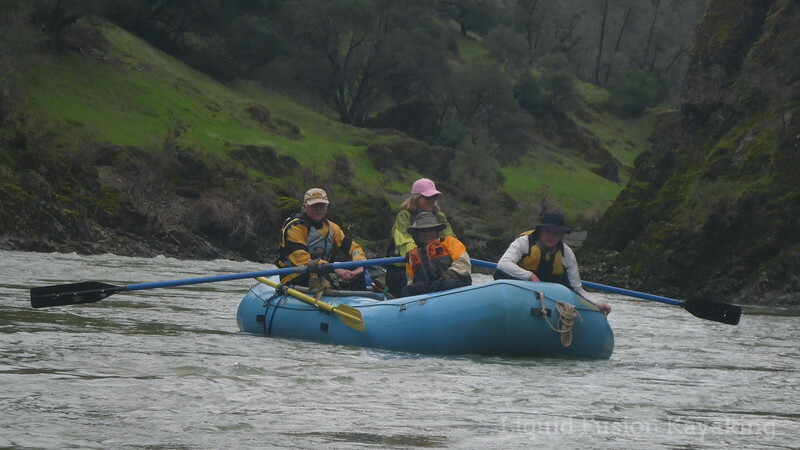 It was very special for them to experience the Eel River and for us to share it. Our paddling pal rigged up his raft to make this possible. Our friends had a great time riding on the raft and even giving the oars a try. Gail giving the oars a try. These days, there are many different options for people to get out on the water. If you are getting out on the water for the first time or wanting to get friends or family out on to the water for the first time, take your time and figure out what's the right experience for them. This includes where, what boat, when, and with who. Maybe you prefer a performance craft but be considerate of what will be best starting point for you and/or your friends. 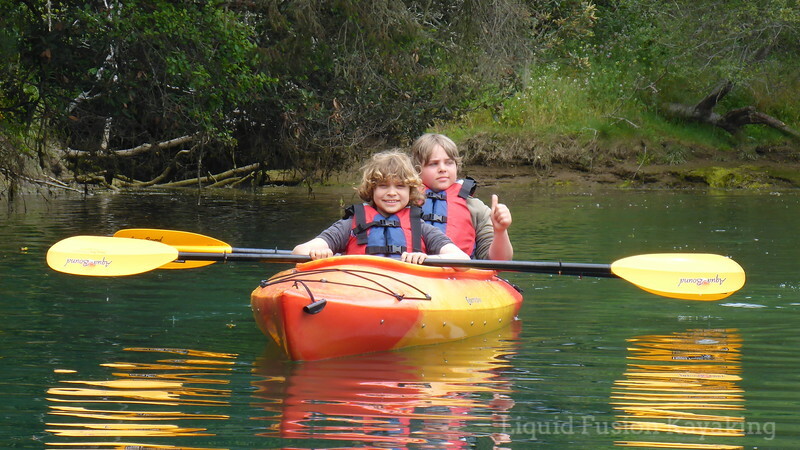 Tandem recreational kayaks are stable and an easy way to make kayaking fun and accessible for all ages and abilities. The water world is a fun place to play but not all craft and waters are ideal for all folks. When in doubt, consult a reputable instructor or guide in the area where you want to go. Whether it is sharing a trip on the water with friends or customers, my goal is for everyone to enjoy the experience so much that they are want to go again. Whitewater sit on top kayaks are a great way to hook folks on ocean kayaking and rock gardening. I am stoked that my friends had a great time and look forward to going again. We made a lot of great memories on the trip and have many stories to share. My mission was accomplished - they had so much fun that they are looking forward to the next trip! Fun sharing how we like to play on the river with friends - its also fun to have a peanut gallery when surfing waves. The peanut gallery pulled over to cheer and jeer Jeff and I as we surf this wave. The number one mistake that I see paddlers make when paddling in dynamic water is learning back. It is a natural reaction to lean back when you are dropping in on a wave or hitting whitewater. Leaning forward may seem counter intuitive. There are times when the force of the water or the verticality of the drop tries to push you back. Watch top paddlers - they anticipate those forces and lean forward. 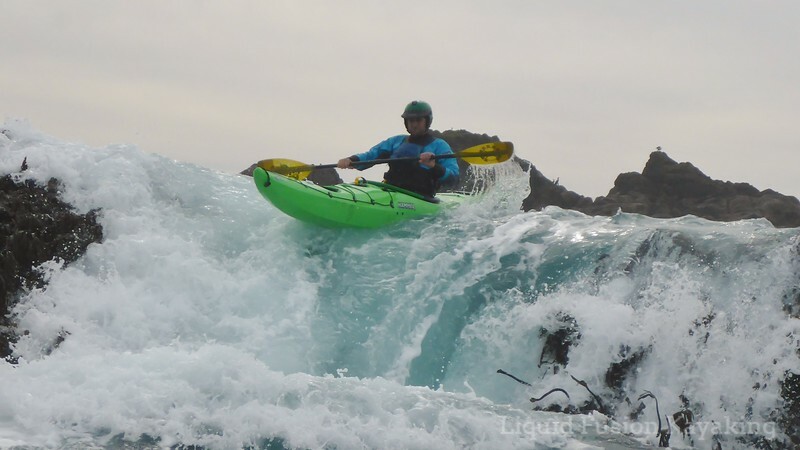 Dave Fusilli takes his whitewater skills to the sea. Here he uses good posture and timing get a sea boof on this pour-over. Lessons Learend - Trim and posture from Christopher Lockyer on Vimeo. Homework - Be mindful of your posture in your everyday paddling. Have a coach or friend video your paddling. 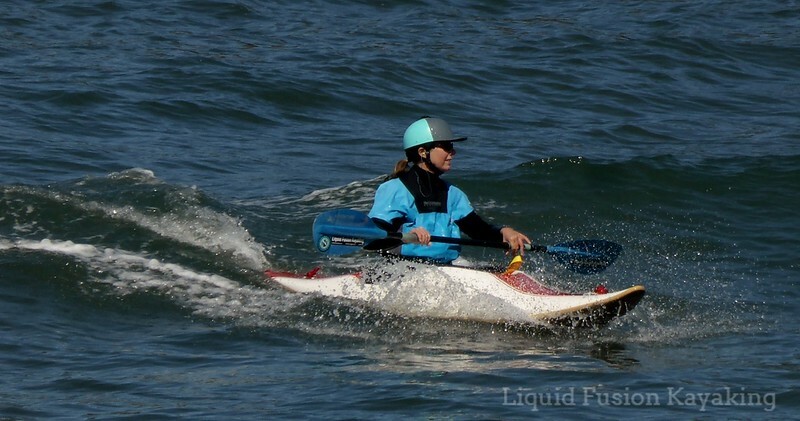 When paddling in dynamic water - whitewater, surf, rock gardens, tide races - be especially mindful that you are leaning forward and not allowing the water or your fear to put you in the back seat (leaning back). Max shows good forward lean on this pour over ride on the Mendocino Coast. I have a small head and have a difficult time finding kayak helmets that fit. Most are just too big! To make them work, I have to add tons of paddling. Then they look and feel huge on my head. For years, I found the WRSI Current helmet to work. 2 years ago, they changed the padding on the helmet. It was definitely more comfortable, but I had a hard time getting it to fit securely like my old one did. So - I have been playing Goldilocks and trying out new helmets. 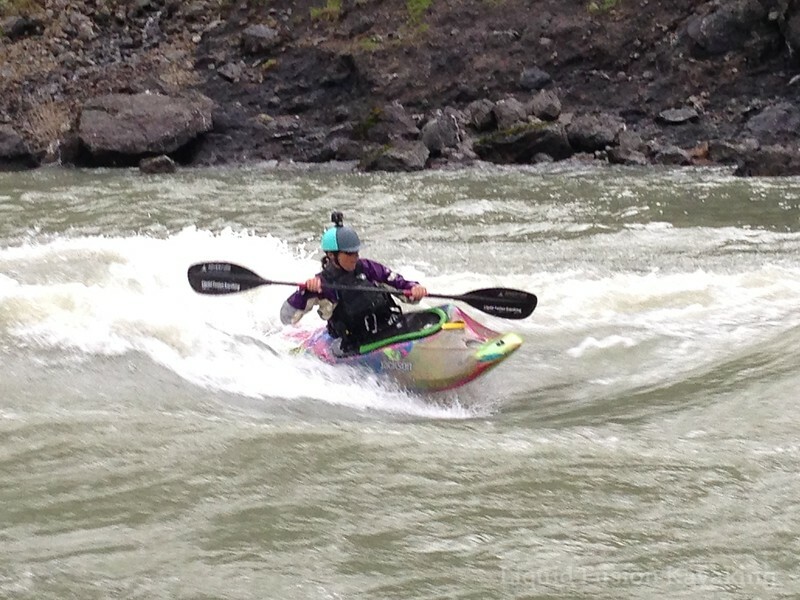 Last fall, a paddling pal had a demo of Shred Ready's Zeta kayaking helmet. I tried it on and without much adjustment it fit. I ordered one. My small Shred Ready Zeta arrived a couple of weeks ago. With Shred Ready's fit kit, it didn't take long to get it outfitted and adjusted. 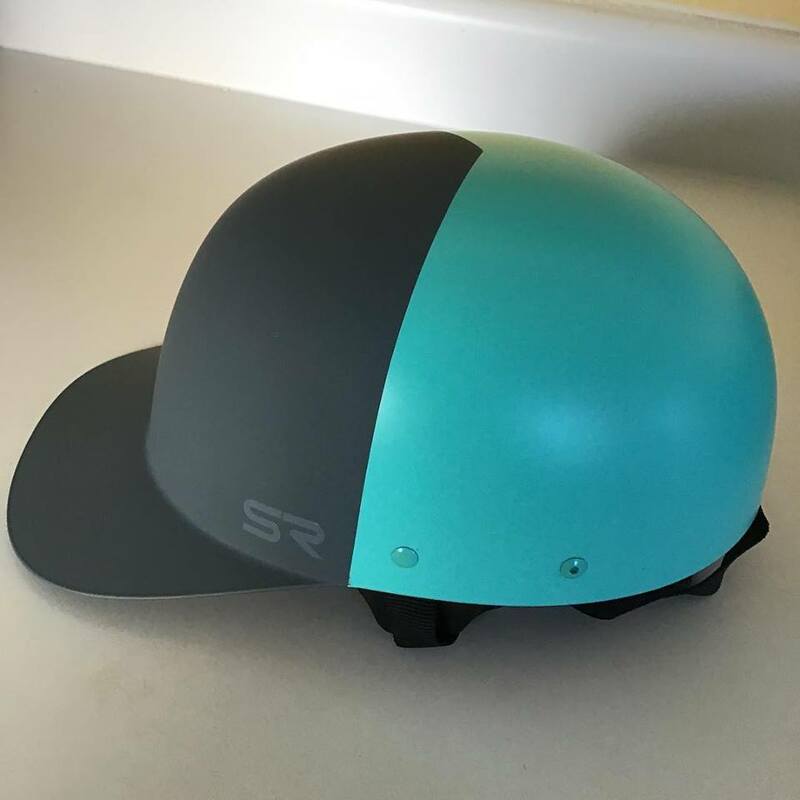 Stylish Zeta helmet from Shred Ready. I have been wearing it and am amazed at how comfortable it is. The fit is secure. Finally a small helmet for a small head - Shred Ready Zeta. I have always been a ball cap wearer and I really like a brimmed hat on sunny days. The brim on the Zeta is great and definitely helps with cutting out glare and shading my face. The brim provides glare and sun protection while on the water. The Zeta has become my go to helmet for sea kayaking, easy whitewater, and small surf. 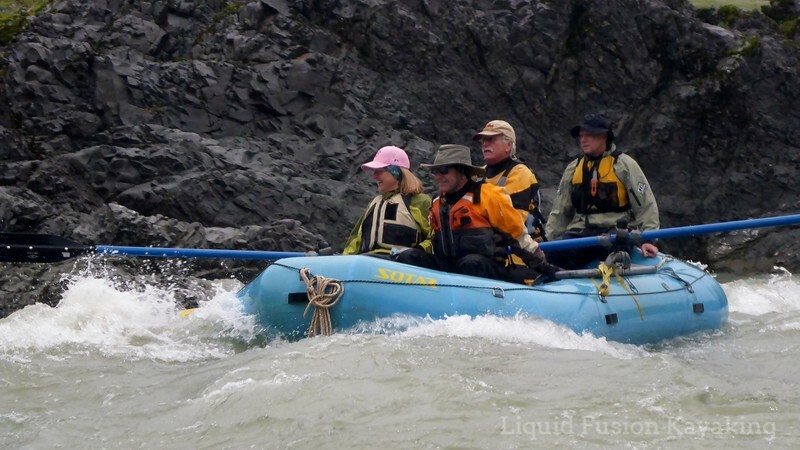 I am a bit skeptical about the brim in larger and harder whitewater and surf. Stay tuned for what I figure out here. Whitewater kayaking on the Eel River. 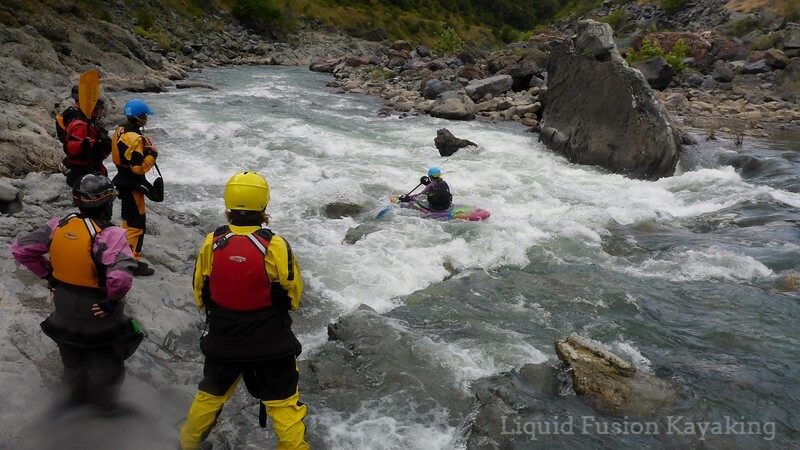 Last week, we premiered a new video for Liquid Fusion Kayaking. 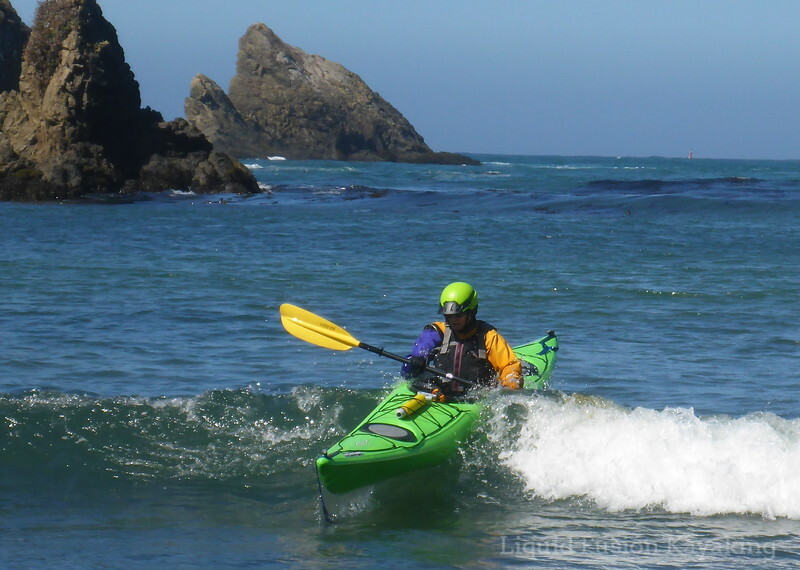 The goal was a short and sweet 1 minute video was a taste or teaser of the magic that we share in our Mendocino kayaking classes and tours. The challenge of making this video was to blend the dry and mild of our Noyo Meander Tours with the wet and wild of our whitewater, Whitewater of the Sea and sea kayak rock gardening adventures. Check out the video and let us know what you think. You can watch it below but it is best viewed on YouTube or on Facebook. This week, we will post a version of it on Instagram. Comment on it and share it! My next video project is a trailer/teaser for our 3 hour Whitewater of the Sea Adventures. If you want to try rock gardening or have friends who you want to get hooked on playing the sea, it is a must do! I also have a few other projects in the works, but you will have to check back to see more on them. When paddling backward (in reverse), are you leaning back? Many paddlers lean back when reverse paddling and stopping quickly. In doing so, they are decreasing their stability, power, and efficiency. Instead of leaning back, try keeping your torso centered over your hips. You will find that your reverse strokes will be more powerful. Your core will be more engaged, and you will be more stable. For even more power, focus on crunching with your abdominal muscles and pushing with your feet. When I do this, I envision myself as compact and powerful. Think about punching - you don't lean back to punch. Practice, practice, practice good posture when reverse paddling and stopping quickly for it to become muscle memory. 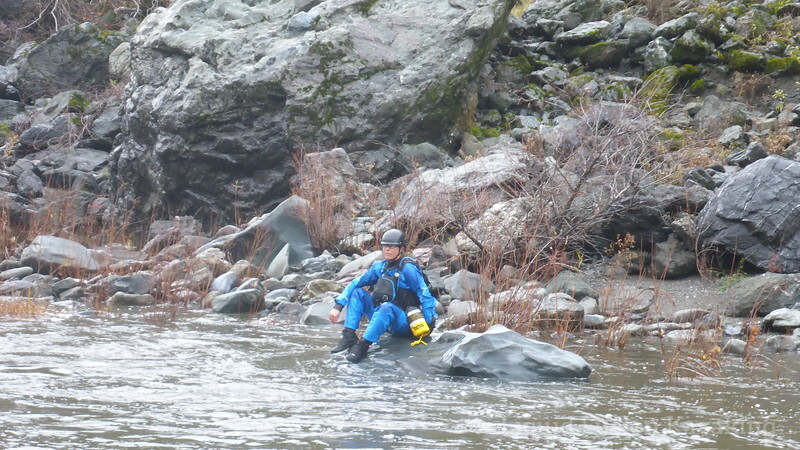 And especially focus on this good posture when in the surf, whitewater, or rock gardens. You will find yourself more powerful and stable. 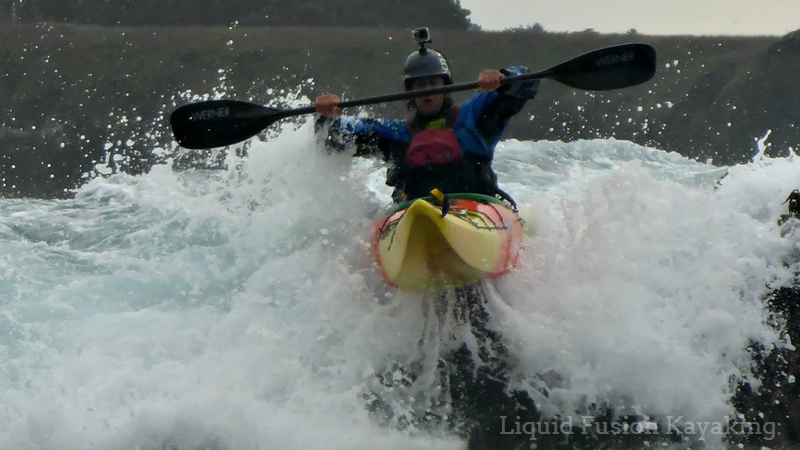 A Liquid Fusion Kayaking student crunching to get good power to back paddle over a wave in the surf. At this time, I was ready for a change in my life. I was not enjoying my job in the public schools. Jeff (my gypsy kayaker boyfriend) had decided to settle down on the Mendocino Coast. We dared to dream about creating a life that involved teaching and guiding kayaking together. 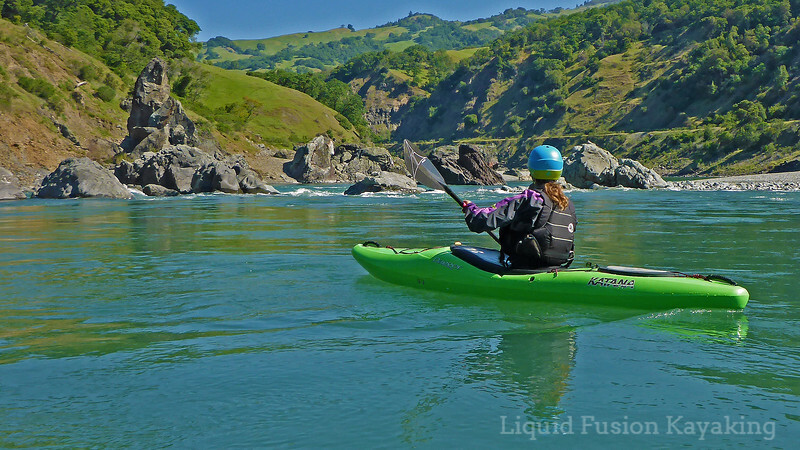 Liquid Fusion Kayak Company evolved into Liquid Fusion Kayaking. 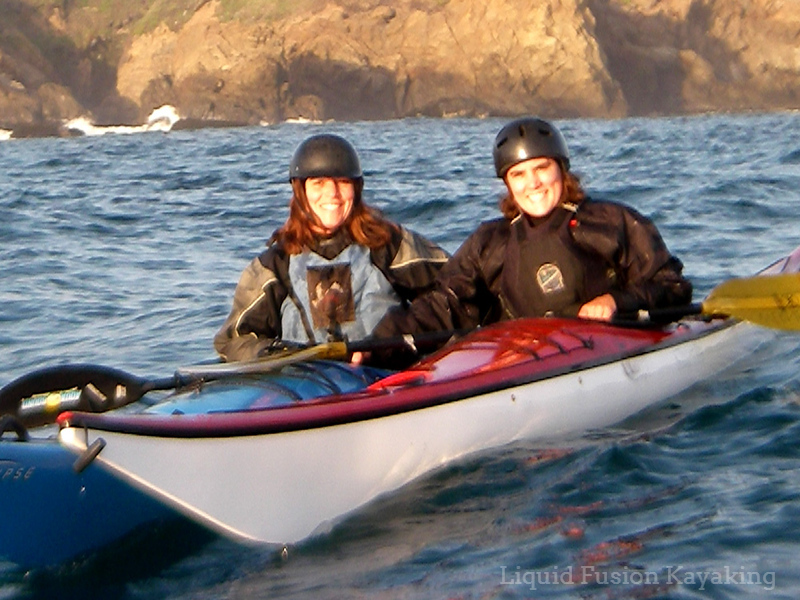 Liquid Fusion Kayaking became a multi-discipline, educational kayak company based on the Mendocino Coast of California. I left my teaching job, took business classes, and focused on building my kayak skills in sea, whitewater, and surf kayaking. After our first season, I wanted to share helpful tips and tell stories about adventures on the water. I decided to start writing a blog. Because the outdoor industry and kayaking in particular is so male dominated, I wanted to write from a woman's perspective. 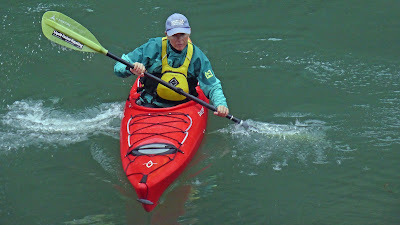 When deciding on a title for the blog, I fondly recalled that Women on the Water evening. I decided to call my blog Woman on Water. The name stuck. 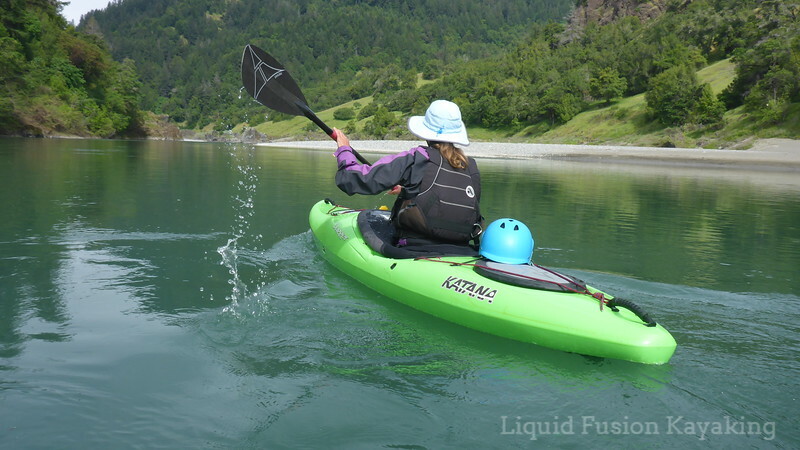 Fast forward to 2019 - I am still teaching and guiding sea, whitewater, and surf kayaking and leading kayak eco-tours for Liquid Fusion Kayaking. I am hoping to inspire people to get off the computer and get out on the water and in nature more. Thanks for reading my story - now get outside! 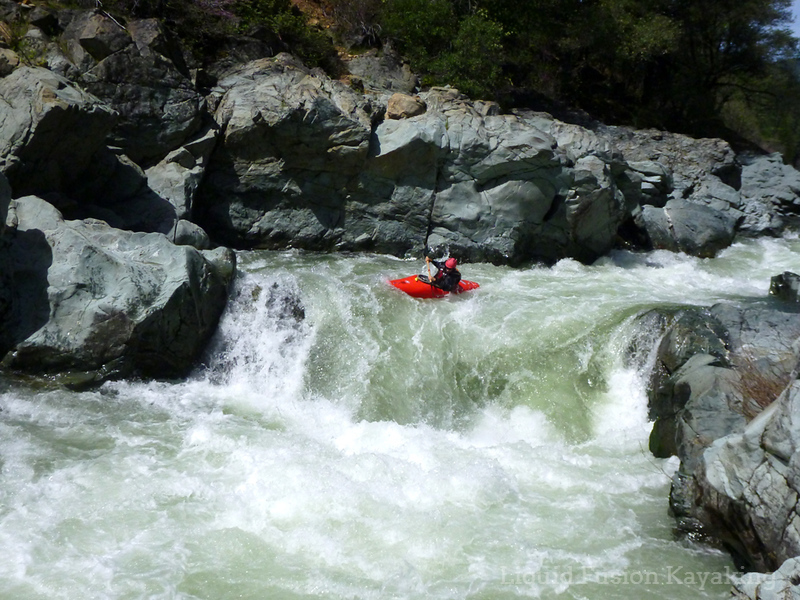 Last week, I posted Why Sea Kayakers Should Learn to Whitewater Kayak. 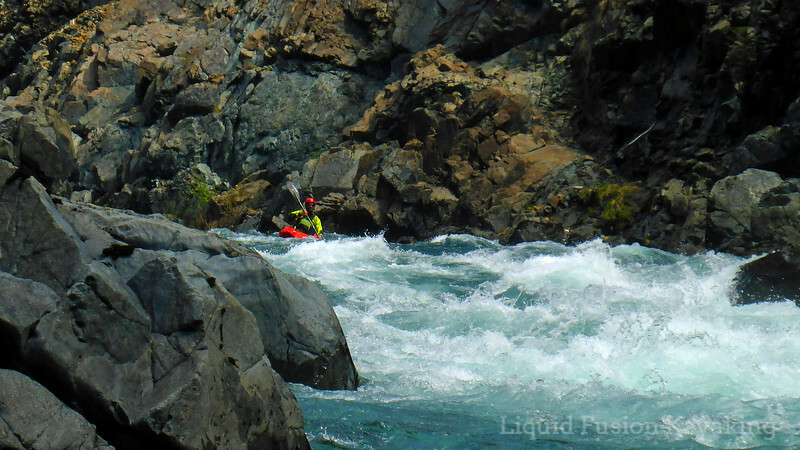 This was a Liquid Fusion Kayaking post compiled by Jeff Laxier and written by me. 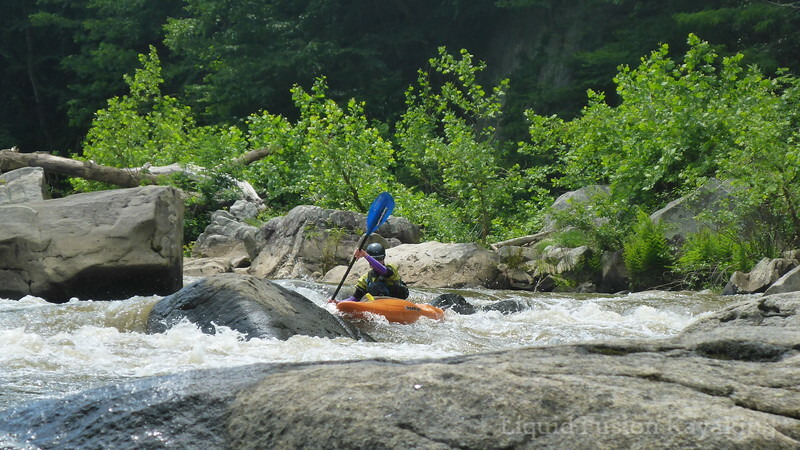 This week, I wanted to share my personal perspective about whitewater kayaking. When I started dating a gypsy kayak instructor (Jeff Laxier), I was gun-ho to learn how to sea kayak and to surf kayak. I was not drawn to whitewater kayaking. I am not inclined toward gravity or adrenaline sports - which was my initial perception of whitewater. My first whitewater kayaking experiences of course involved swimming. As a kid, I did a bit of inner tubing on the river behind our family farm . However; as an adult, I have decided that I really don't like swimming in rivers (I love swimming in the ocean). 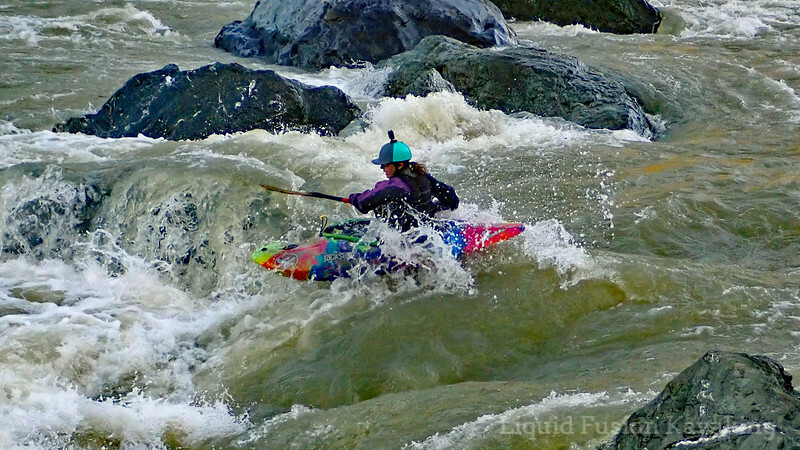 So how did I catch the whitewater bug? Whitewater kayaking is very important to Jeff. In the winter and spring, it is pretty much all that he thinks about. So one winter, I asked him to take me on as a private student and teach and train me how to run the river. He did and I fell in love with whitewater river running. What did I discover and learn about whitewater? 1. 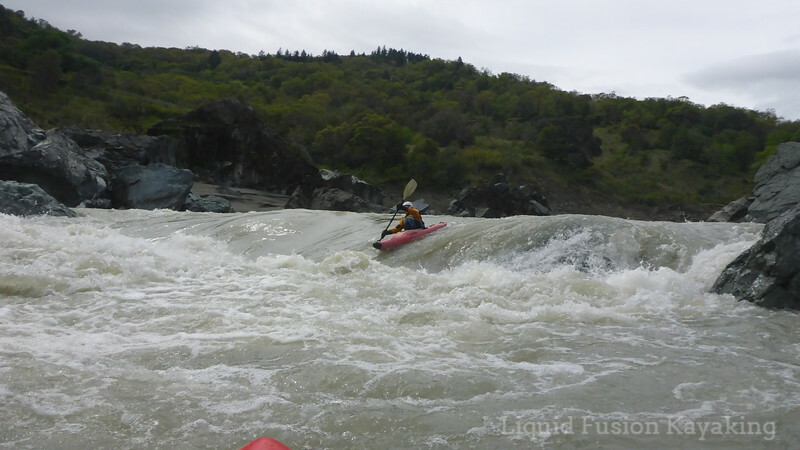 PLAY and FUN - I discovered how playful and fun whitewater kayaks are. They are lighter, more playful, and easier to manage in dynamic water than a sea kayak. A friend lent me a Eskimo Kendo Starlight which is super lightweight. I can easily carry and load it myself. It was so easy that instead of loading up my sea kayak, I started throwing the whitewater kayak in the back of the pick up and playing with it at home in the surf and rock gardens. This of course built my skills for the river and vice versa. 2. A PUZZLE - Initially people wanted me to follow them down the river. Then I discovered that as long as I had a general sense of the line, I liked reading the water and choosing my own lines. I discovered that the rapids were a maze or puzzle that I had to figure out and find my way through. As my skills and water reading developed, I was able to take different lines, catch tricky eddies, and ferry across chutes and onto waves. Now, I love slaloming down the river - ferrying, attaining, and eddy hopping until my cheeks are sore from smiling and my paddling partners are ready for burgers and beers. 3. BEAUTY - River canyons are special places and each has its own unique character. I have discovered that I loved exploring different rivers. 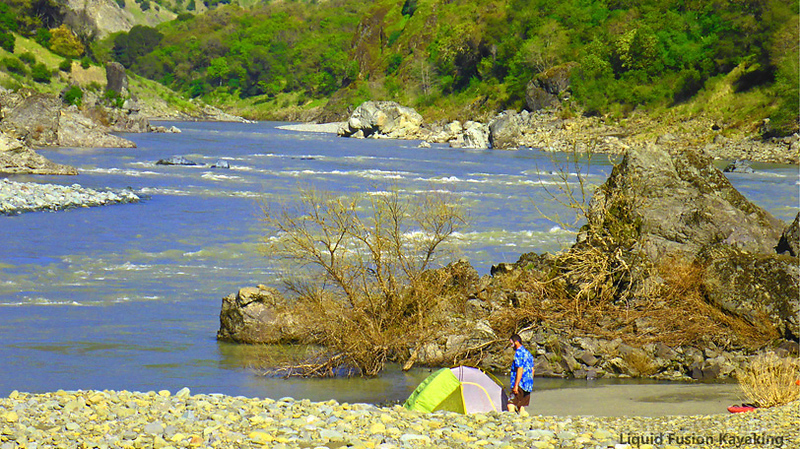 I especially love camping on the river and overnight river trips. There is a magic about the 360 degree immersion in a river canyon. The peacefulness to river running - going with the flow, watching for wildlife, and contemplating the scenery - speaks to my soul. The Smith River is one of the most beautiful places in the world. Vision - Looking where you want to go is key. Find a reference point (a tree or rock) and focus your vision on that spot to get where you want to go. Conversely - avoid looking at hazards or obstacles. Drive - The river has current and momentum but sometimes you have to be aggressive to make your kayak go where you want it to go. I tend to go with the flow and try to be as efficient as possible. Whitewater kayaking has taught me that there are times when you need strong powerful strokes to get where you want to go. For example to build up speed to leave an eddy. Fear Management - Things happen fast on the river and you have to learn to be in the moment and let go of fear. I have found that taking a couple of deep breaths before starting down a rapid helps me to relax. The more relaxed I am, the better I am able to move and work with the water. Decision Making - I like to challenge myself but have learned to know when to say when. Some times it is portaging a rapid and other times it is opting for an easier run or a day off. 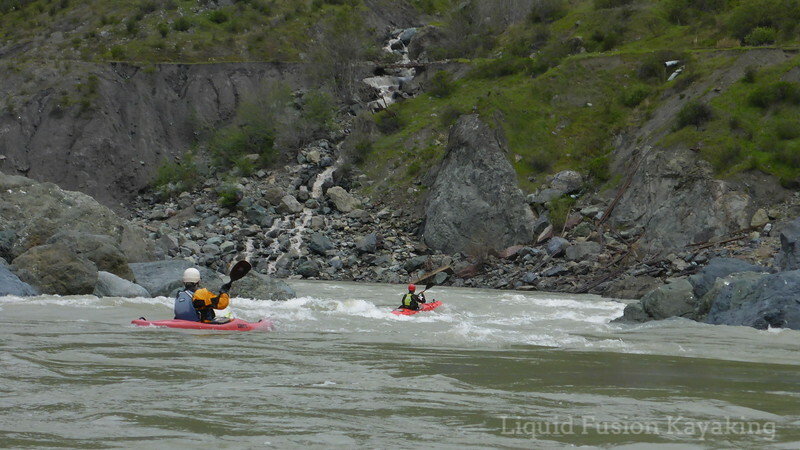 Days when a river it above your skill level, the paddling group is questionable, or you are feeling "off" are good days to eddy-out and choose a different adventure. Always have a Plan B and C. I always carry in my kit a good book to read, a pair of hiking shoes, and a camera so that I have enjoyable options if I decide not to run the river that day. 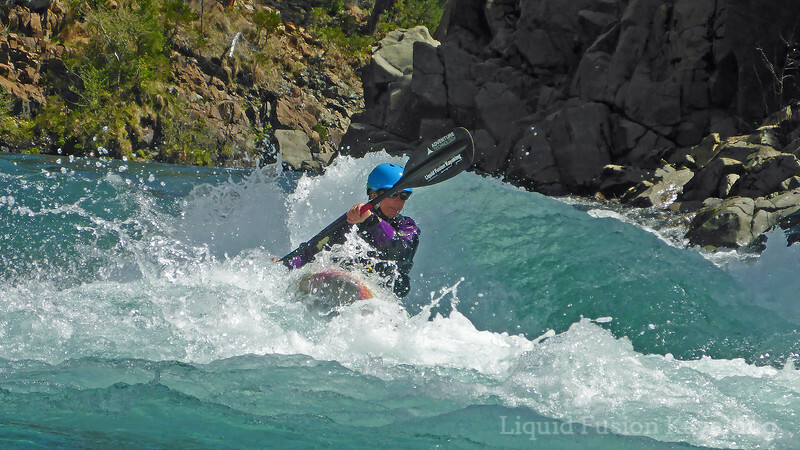 Whitewater Technique - Vertical paddle strokes, stern draws, edge control relative to the current, surfing standing waves, and boofing are whitewater specific skills that I have generalized to improve my overall paddling skills - especially when sea kayaking in rock gardens and surf. Learning to run whitewater has definitely has made me a better all around sea kayaker. It has also opened up a world of different paddling options. As I am writing this post, I am dreaming of our next multi-day self support whitewater river kayak trip. If you haven't given whitewater kayaking a try, I encourage you to find a seasoned and reputable instructor and take a lesson or class. 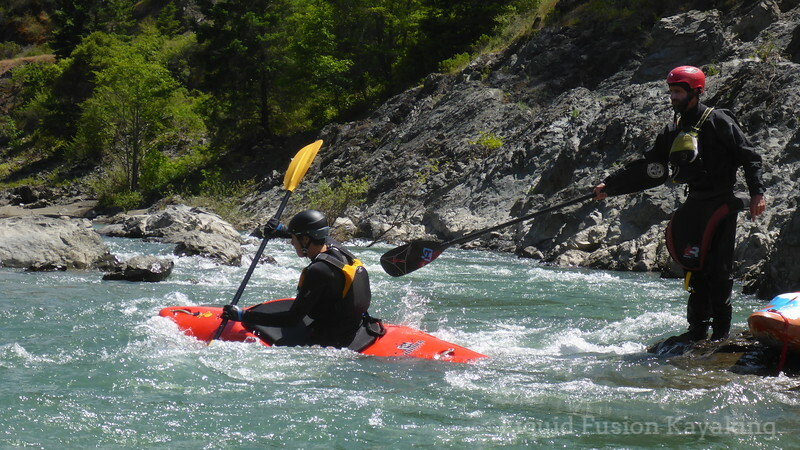 If you don't know how to roll, sit on top whitewater kayaks and inflatable kayaks can make whitewater kayaking fun accessible. 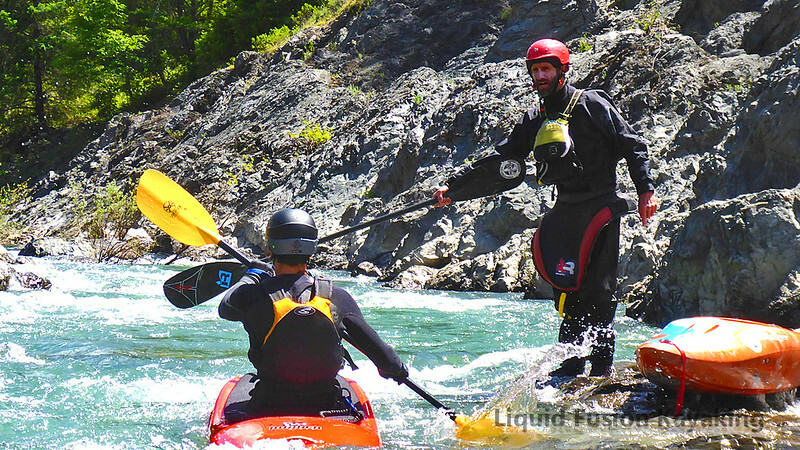 Jeff Laxier makes sure that you develop the fundamentals before moving on to harder water. 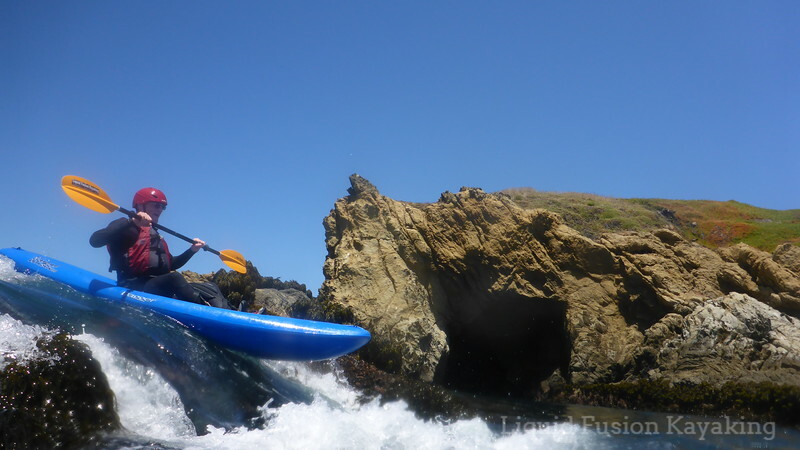 My partner Jeff Laxier and I often wonder why don't more sea kayakers paddle whitewater rivers - especially sea paddlers who like to play in rock gardens and surf. Both Jeff and I see huge improvements in our students' skills when they take up whitewater river kayaking. We both can attest to how our personal skills in the sea improve the more we run the river. 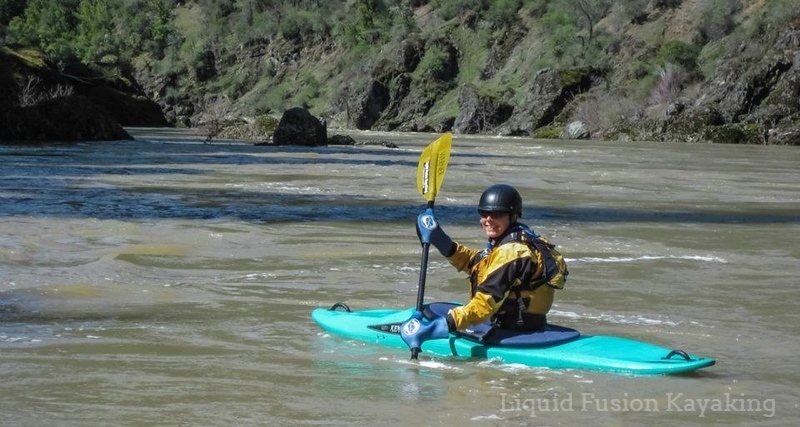 Jeff wrote the following post for Liquid Fusion Kayaking's February newsletter. 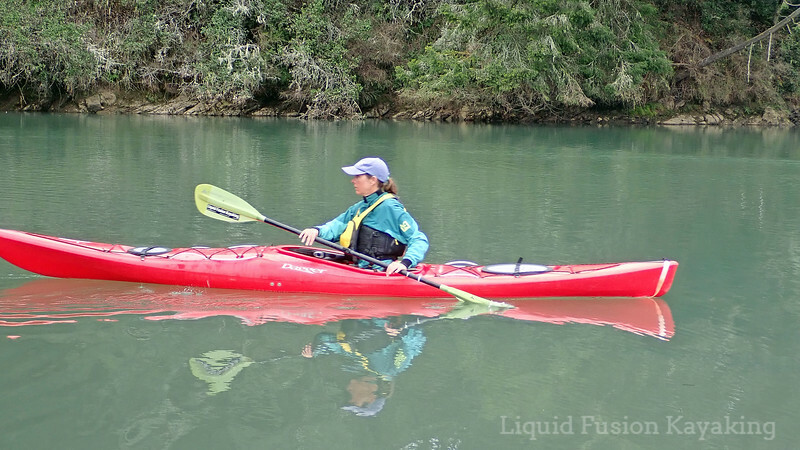 If you are interested in finding out more of what we have going on with Liquid Fusion Kayaking, sign up to receive our monthly newsletter. 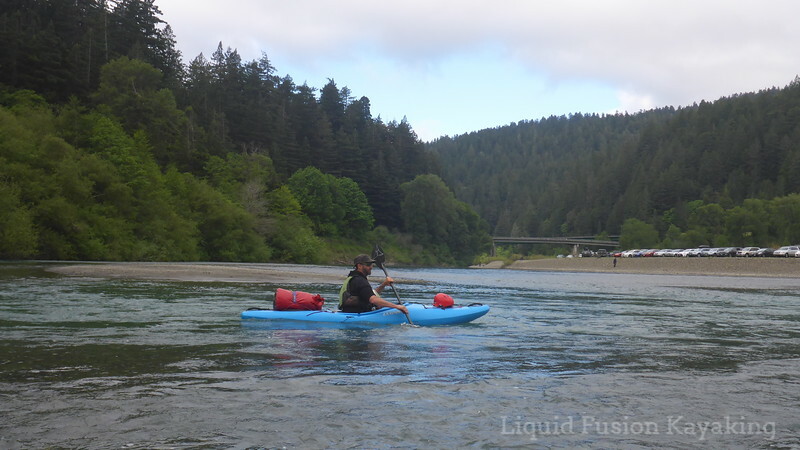 Jeff Laxier kayaking on the Smith River. 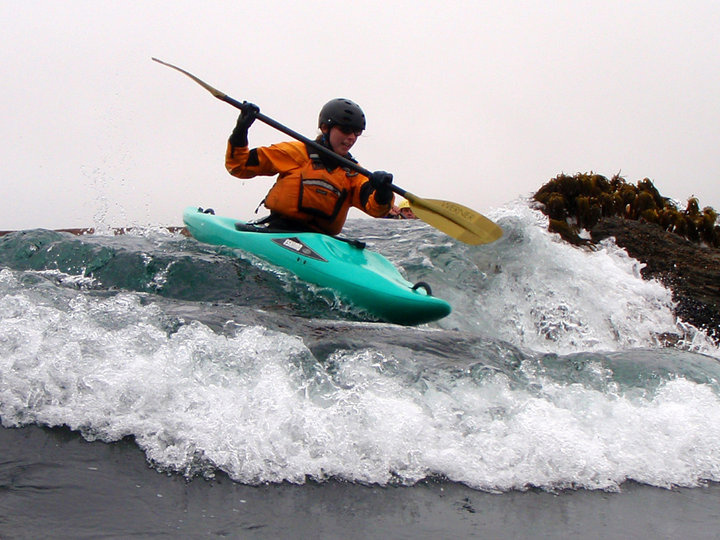 Do you want to improve your skills to have more fun paddling dynamic waters – rock gardens, tide races, over-falls? If so, LEARN to RUN WHITEWATER RIVERS. Becoming proficient on the river will accelerate your learning and performance on the sea. Students working on peeling out of eddies during a Whitewater River Kayaking Class on the Eel River. Class II/III Whitewater Rivers are a lot of fun. 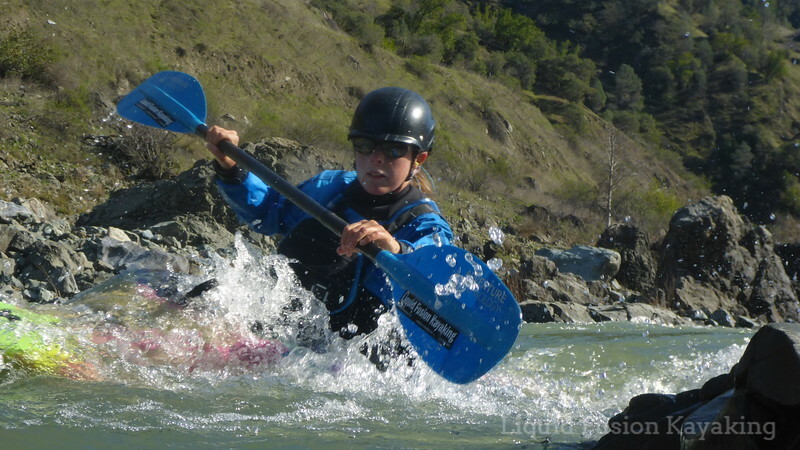 With systematic instruction and experienced guidance, the skills to paddle Class II/III rivers is attainable by most. 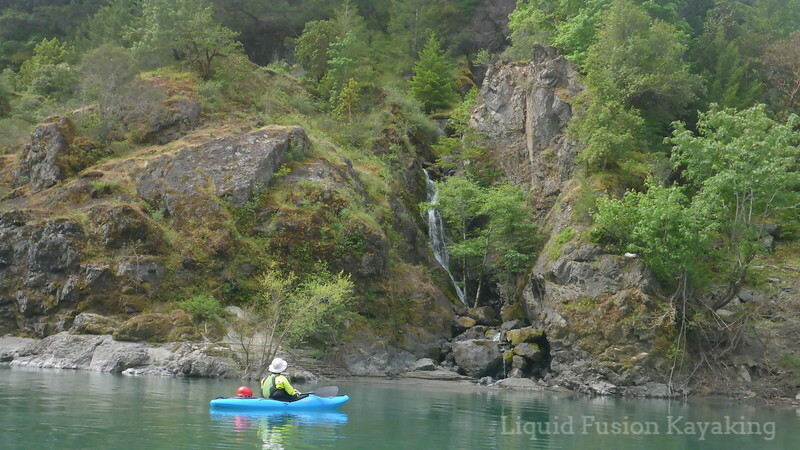 Once you know how to paddle a whitewater river, you may be tempted to plan multi day sea kayak river trips like on Oregon’s John Day River, Utah’s Colorado and Green Rivers, and even Northern California’s Eel River. 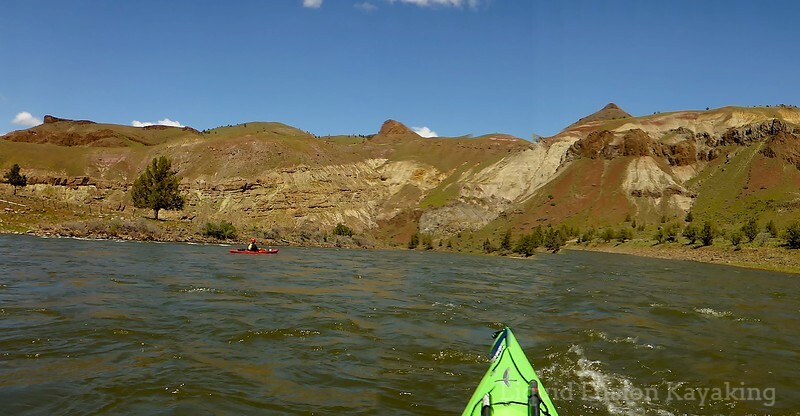 Multi-day river running trip in sea kayaks on the John Day River. Mendocino's sea caves are world famous. The whole coastline is like swiss cheese with notches, caves, holes, arches, and tunnels. 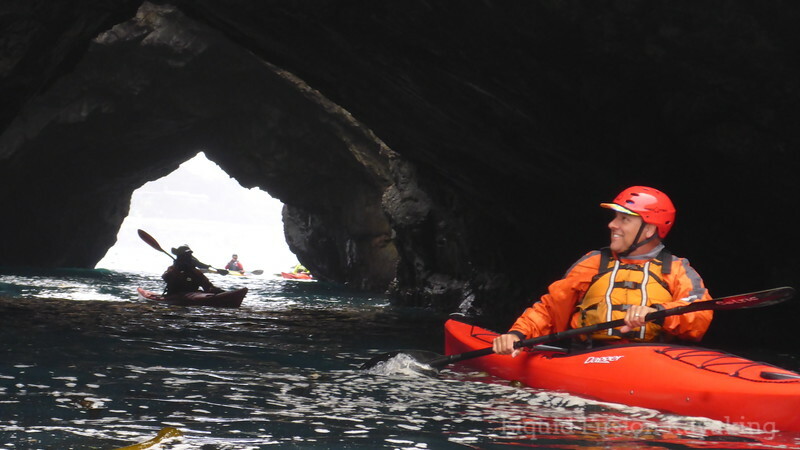 Sea kayaking through arches and into sea caves on the Mendocino Coast of California. When walking on the coastal headlands, one can see the alluring arches, tunnels and dark cave entrances. On calm days, kayakers get the opportunity to paddle into the caves. And of course some of us push the limits a little - surfing through arches and playing in rowdy sea caves. Have you ever wondered "How are sea caves formed?" This winter, we have had lots of cave making days. This inspired me to share a little bit about how sea caves are formed and some photos and videos from our wet and wild winter of 2018-2019. Winter storm surf crashing into the Noyo! The simplest answer is that sea caves are formed by erosion. Coastal erosion is also referred to as coastal process. Check out this website for more information on coastal processes including wavelogy. To specifically see how sea caves, arches, and sea stacks (stumps) are formed check out this video. 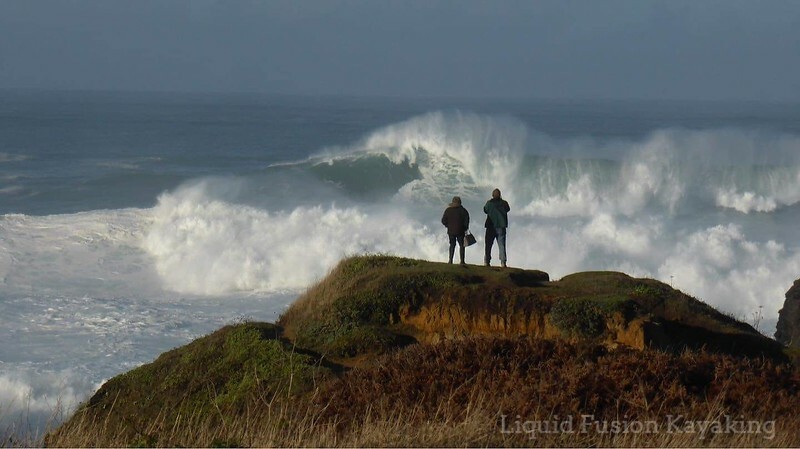 In the winter, winter storms often generate large swells that roll into the Mendocino Coast. Usually we have one large swell event per winter (25 feet plus waves). This winter, we seem to be having these events every other week. 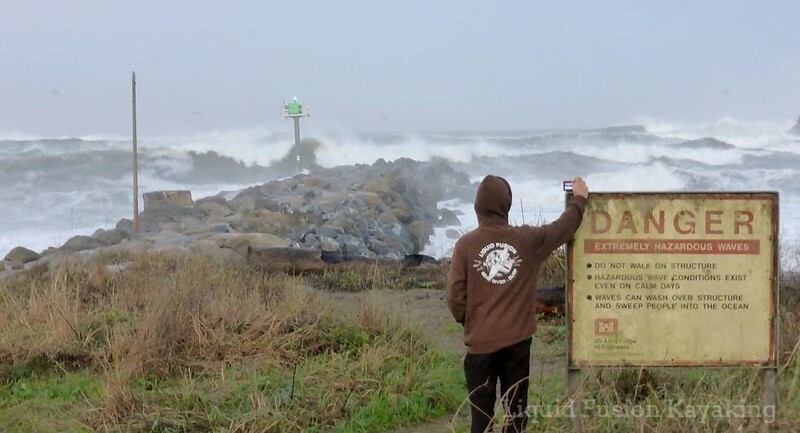 Awesome winter storm surf on crashing into the Mendocino Coast. It is very exciting. We can hear the surf and feel its energy from our house - which is about a mile from the ocean. When you get close to the ocean, the power of the large surf is AWESOME! While watching waves roll through the bays and hearing and feeling them crash onto the headlands, one feels the energy permeate through your soul. As sea level is rising and we are having higher tide, the effects of large surf in the winter months during our king tides is significant. One could speculate that it is increasing the rate of coastal erosion. We often comment that it is another cave making day. Then we see the effects - logs and jetsam are chucked up on the headlands. At the Point Cabrillo Lighthouse, one of their informational signs was annihilated. Landslides and rock falls are happening. We have not seen any arches collapse., but it is a possibility. 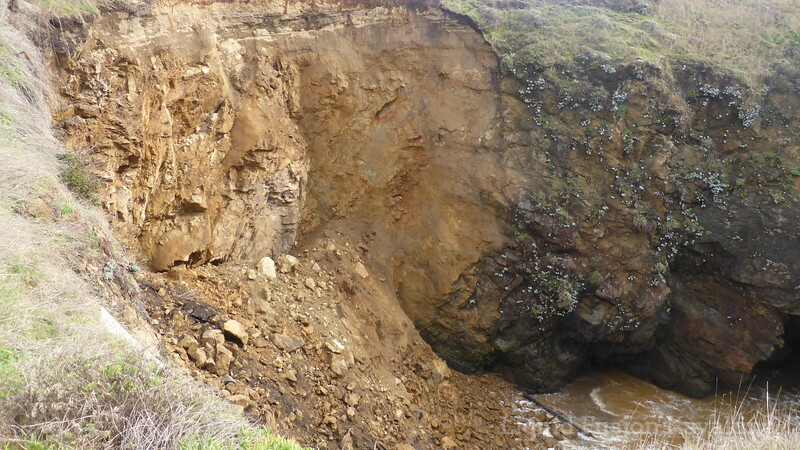 To the south of us in Point Arena, a huge sinkhole with a cave leading to the ocean has opened up. In Noyo Bay, the Sinkhole Cave is one of our favorite paddling spots. 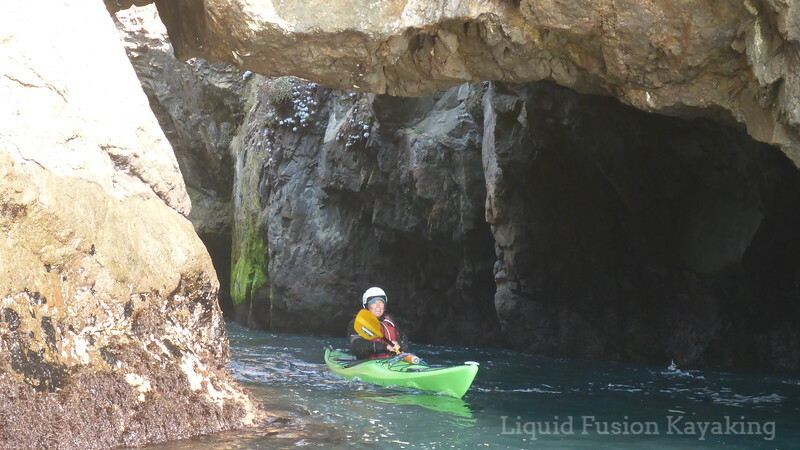 Sea Cave Kayaking on the Mendocino Coast. Last week, we were walking on the coastal headlands and saw muddy water flowing out to sea. Moments later, we discovered a large landslide occurred on the back wall of the Sinkhole Cave. Landslide into the back side of the sinkhole cave on the North Side of Noyo Bay. Today, I was walking and saw that it has slid more. The ground around it is cracked and looks to be ready to slide further. This week, we are forecasted to get over 5 inches of rain. The weekend the swell predictors are in the 30 plus foot range. I'd say that it is likely to slide more. 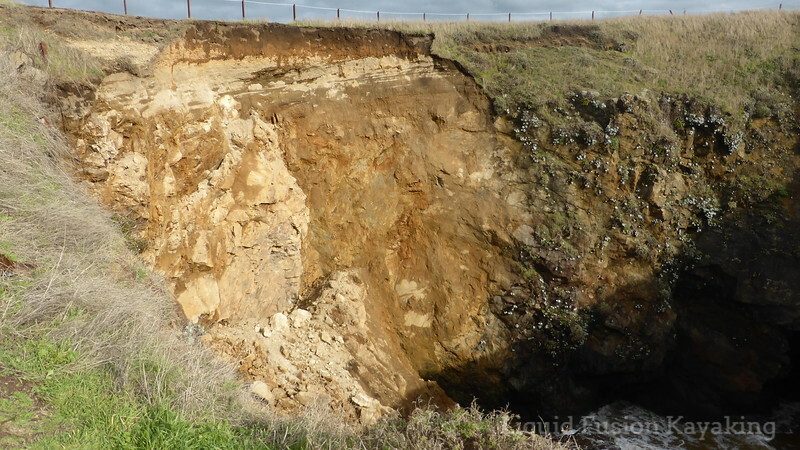 Coastal erosion on the Mendocino Coast of California. These are exciting times. 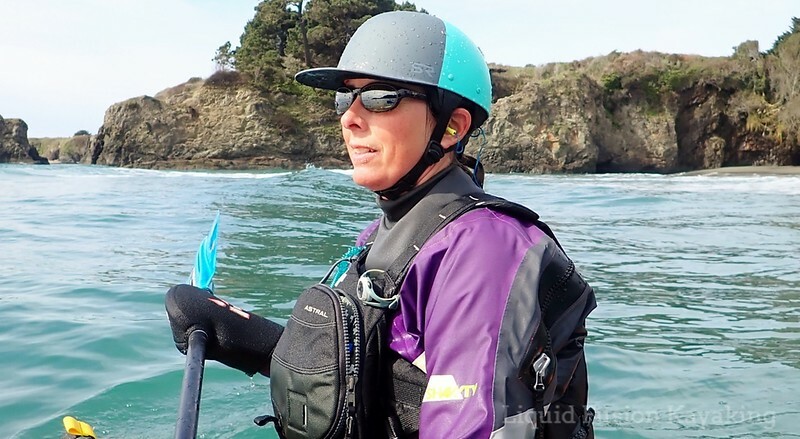 The next time that you kayak on the Mendocino Coast, things could be quite different. Sea caves could have more head room and potentially there maybe more rocky rubble in passages that are clear. We of course have a couple of spots in mind that we would like to see some moving and shaking. Probably best not to do any sea cave kayaking for a while. This summer when things have dried out and the swells have mellowed out, we will be back in Mendocino's sea caves and let you know what we find.